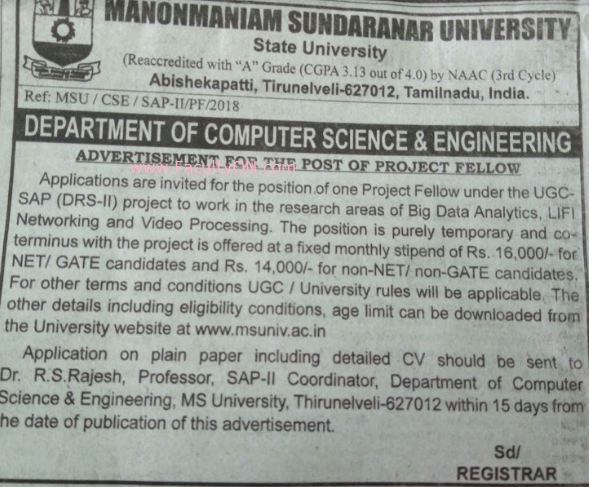 Manonmaniam Sundaranar University, Tirunelveli has advertised in the DINATHANTHI newspaper for the recruitment of Research Faculty- Project Fellow jobs vacancies. Interested and eligible job aspirants are requested to apply within 15 days from 07th October 2018. Check out further more details below. About University : Manonmaniam Sundaranar University (MSU), named after the famous Tamil Scholar Professor P. Sundaram Pillai, was established on 7 September, 1990 to cater to the long felt needs of the people of the three southern most districts of Tamil Nadu namely Tirunelveli, Tuticorin and Kanyakumari. The University has under its jurisdiction 61 affiliated colleges, 5 Mano Colleges and 1 Constituent College, with 65,000 students on rolls.The concept of community colleges, being experimented under the aegis of a special wing, offer diploma courses of one year duration to those interested in entrepreneurial enterprises and the Extension Learning Programme run by this wing also offers diploma and certificate courses on skill development. How to Apply: Interested and eligible candidates are requested to send application on plain paper along with a detailed CV, copies of certificates and recent PP size photographs to the following postal address.